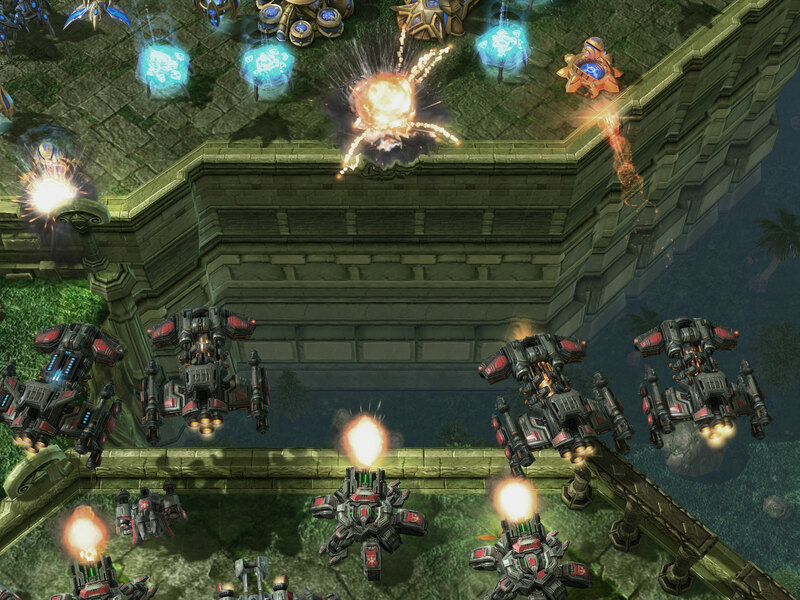 I'm enjoying the StarCraft 2 beta, but have run into a few problems. The most immediate is I'm not very good at SC2. I'll keep putting in the time and effort - and phone calls to my brother - and hopefully I'll improve as time goes on. My other roadblock is that I'm borrowing the beta account from a friend. The person using the account before me was really good at SC2. Because of this, the account is in the platinum league for 1v1 games. Every time I play a 1v1 I go up against the best of the best and end up losing. It makes for some very insightful replays, but it isn't much fun to lose every time. I'm looking forward to Blizzard resetting the ladders soon. As a result I have been playing a lot of 2v2 games. They are really fun when I get paired with a decent teammate. Even if we lose it is still a great experience working with someone and not just against them. One map in particular has teammates essentially sharing a double sized base, instead of being in different areas of the map. It is my favorite 2v2 map so far. I hope that more of my friends get beta keys soon because 2v2 games with a real-life friend would be even more fun. It helps when you know the person on the other end of the internet that you are playing with. The main thing for me right now is to think of SC2 as a learning process. It is like extremely complicated video game chess. I'm still learning the tech trees and slowly figuring out what unit is a good counter to other units. I'm refining my build order at the start of the game. I'm learning new strategies from replays when I lose. But, mostly I'm trying to keep a positive attitude. Overall, I'm really enjoying finding my way in StarCraft 2. What about when we were taking turns losing in gold league 1v1 and after losing 5 times in a row it put us in platinum. Oh, good times, good times. The ranking system must only sample games every so often, otherwise that wouldn't make sense. It was weird. At least when we were in gold I felt like I was making a dent. Now when we play 1v1s, it's like trying to scratch a tank with a kitten.